A crafty and effective small forward, Athol Webb played a key role in the dominant Melbourne sides under Norm Smith in the 1950’s as well as a number of Tasmanian clubs, particularly as a coach. Born in the small north-eastern community of Ringarooma in 1935, Webb made his senior debut for Scottsdale in the NTFA at the raw age of 15. Within two years the first approaches came from across Bass Strait, as Melbourne invited him to play some pre-season practice matches with them in the hope that the talented 17-year old would sign. Webb agreed, however he had no intention of staying in Victoria – in fact he had only agreed so he could say that he had played and trained on the MCG – and returned to Scottsdale for the 1953 season, taking out the club’s Best and Fairest award. After a phenomenal 1954 season – in which he kicked 20 goals in four games for the NTFA combined team and represented Tasmania against the Australian Amateurs – Melbourne came calling again. This time Webb agreed to go, however the TFL were less keen on the talented teenager moving to Victoria, however eventually relented and Webb made his senior debut for the Demons in Round 12 of 1955. He would play eight games for the season for a return of 14 goals, however was surprisingly dropped for the Grand Final against Collingwood in favour of fellow Tasmanian Noel Clarke, and subsequently missed the Demons’ premiership. After 28 goals in 20 games in 1956, Webb finally clicked at VFL level in 1957. He booted 56 goals in 21 matches to win the Demons goalkicking award, his tally including a haul of 8 against Geelong and three in the Grand Final win over Essendon. Despite his small stature, he was frequently utilised by Melbourne coach Norm Smith as a decoy target to ‘Big Bob’ Johnson, with Webb often times outperforming the 198cm giant. He would take out the goalkicking award again in 1958 with 44 goals, this time sharing the award with Ron Barassi, however he was one of many Demons to have a forgettable day in the Grand Final loss to Collingwood, failing to kick a goal as the Magpies stunned the three-time defending premiers by 18 points. 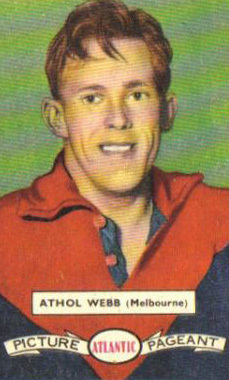 After only five games in 1959, Webb decided that his time in Victoria was up. Thankfully opportunities were not in short supply, as he had three equally lucrative coaching jobs – West Perth, New Norfolk and Ulverstone – dangled in front of him. Eventually Webb took up the position with New Norfolk, a two-year deal worth £1000 per season replacing – ironically – the man for whom he had been dropped for the 1955 Grand Final – Noel Clarke. In two seasons at Boyer, Webb led the Eagles to a finals appearance and a wooden spoon, and in 1962 he returned to his original stomping ground of the NTFA as captain-coach of perennial cellar-dwellers East Launceston. He performed well for the first season and a half, before an extremely serious back injury incurred in a match against North Launceston abruptly ended his career. He would see out the 1963 season as coach at East, before making history as the first full-time coach ever appointed in the New South Wales Australian National Football League (NSWANFL) when he signed with the Western Suburbs Magpies. He coached the Magpies to a premiership in 1965, at which time he retired from top-flight football, eventually settling in the Riverina region of south-west NSW. He finished his playing days with 10 seasons at the The Rock-Yerong Creek Football Club in the Farrer Football League, serving as captain-coach for the first three. Webb remained living in New South Wales into later life.